Find out all about the night sky at Nottingham Trent University's Trent Astronomical Observatory. Built in 2006 and located on NTU's Clifton campus, the observatory is fully recognised by the International Astronomical Union (Observatory Code: J06). The state-of-the-art facilities at the observatory include a unique 20-inch modified Newtonian and a 14-inch Meade LX200 telescope. These facilities are used by students from across the University for labs, final year projects or extracurricular astrometry work. They offer the venue for our monthly Open Dome events with the observatory also being used for outreach activities involving schools and the local community as well as the NTU Work Inspiration Scheme. It has also become a learning destination for the Children's University. a talk focusing on interesting, recent and sometimes surprising topics relating to astronomy. time for members of the audience to talk to scientists about astronomy and ask questions about topics raised during the event. either a presentation in our planetarium or a chance to observe the night sky at our observatory. Our events are supported by the Institute of Physics (IoP) and are designated learning destinations for the Children's University. We put on events specifically for a younger audience and families at least twice a year. it is the responsibility of the accompanying teacher, parent or guardian for the supervision of children while at these events. 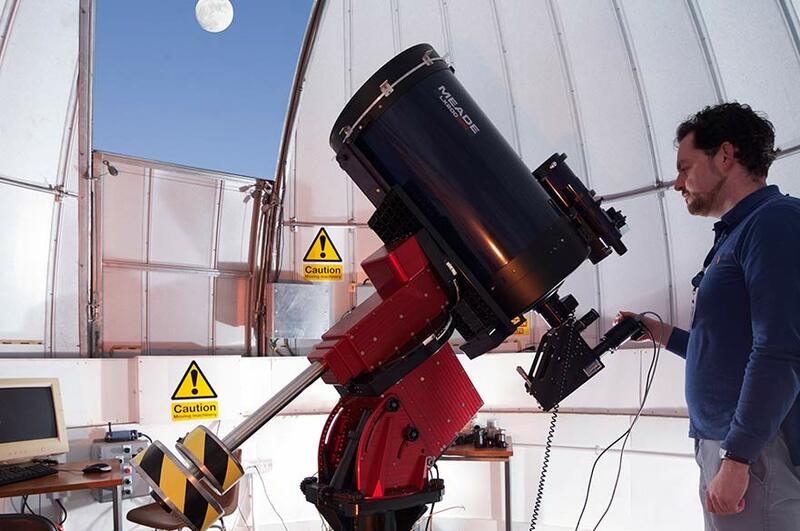 20 inch Newise Modified Newtonian telescope – The largest telescope in the UK specifically designated for the use of students in an on-campus observatory. 14 inch Meade LX200 telescope – A Schmidt-Cassegrain telescope providing high image quality. SV-50 Solarview 50 mm – Specifically designed telescope to observe the Sun in H-alpha emission line. SXV H9 / SXV H9C – Charged Coupled Devices imaging in both monochrome and coloured light. Littrow Spectrograph – A high resolution spectrograph that can easily resolve details in the H-alpha line. GRISM – A Slitless grating allowing multiple low resolution spectra to be taken. Filters Broad-Band / Narrow-Band – A selection of B, V, and R filters as well as narrow interference filters for OIII, NII, and H-alpha. Cassicorp 2.3 m radio telescope – A radio telescope able to observe both continuum and (21 cm neutral hydrogen) spectral line.